Starting with the star of the family, the $300 Moto G7 costs $50 more than last year’s G6. But for that extra money, you get a significantly larger 6.2-inch 2270 x 1080 screen (versus the the G6's 5.7-inch display), a nifty teardrop notch, Qualcomm Snapdragon 632 processor, and 4GB of RAM and 64GB of base storage, which is the same amount of memory and storage as what you get in a Galaxy S9. Not bad. 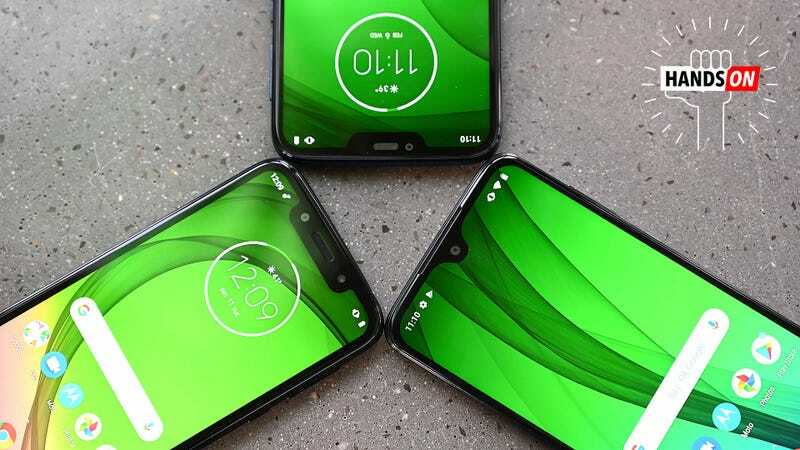 If Moto’s budget phone lineup was a real family, the G7 would be the favorite child. The G7 is also the only member of the family to sport dual-rear cameras, which is a nice bonus. Though for the G7's cheaper siblings, Moto has customized the G7 Power and G7 Play’s camera apps so that they too can shoot portrait mode photos using software instead of having an extra sensor. The main difference between the G7 and G7 Power aside from the latter’s much larger battery are the G7 Power’s single rear camera and lower-res screen. Finally, the $200 G7 Play rounds out Moto’s budget phone family, and while its plastic back, 2GB of RAM, 32GB of storage and smaller 5.7-inch screen start to show where Moto pulled back to bring the G7 Play’s price this low, there still don’t seem to be any major missteps. For just $200, it’s hard to get too upset about a phone having a plastic back. All three phones will also come with essentially a stock implementation of Android 9 Pie out of the box, headphone jacks, and tweaked camera apps that support several different shooting modes that let you capture cinemagraphs (similar to what we saw on the LG V40), hyperlapse videos, photos with selective colors, and even special high-res shots that combine multiple frames into a single image to help avoid the pitfalls of traditional digital zoom. And here’s the whole G7 family together. From left to right we have the G7 Play, the G7 Power, and the standard G7. Here’s a taste of the G7 family’s various photo modes. This is what the G7's selective color/spot color mode does.